In my last post I introduced Arthur M. Young’s book The Geometry of Meaning, in which he shows how the deep, metaphysical aspect of every situation can be symbolized by numbers and angles—specifically the number 4 and the right angles formed when a circle is bisected by perpendicular diameters, like the crosshairs of a telescopic sight. But I mentioned that this geometrical analysis applies, so far, only to static situations; it does not yet include the phenomenon of change. Change, it turns out, is symbolized not by the number 4, but by the number 3, what Young calls “the threefold cycle of stimulus, response, and result”. You might think also of the Hegelian triad of thesis, antithesis, and synthesis. In each case there is the suggestion of a dynamic: a push, a push back, and a new resulting state which, in coming to be, constitutes its own new push, moving the cycle forward again. It is a way of cognizing or analyzing processes, and its threefold nature is symbolized geometrically by the equilateral triangle. (By contrast, the actual figure associated with the fourfold division is the square, formed when you connect the points at which the two lines intersect the circumference of the circle.) When this triangle is inscribed in a circle, it cuts the circle into 3 arcs of 120 degrees. Using these two inscribed figures in the circle, Young works out their relationships to form what he calls “the Rosetta Stone of meaning,” which turns out to be a circle cut into 12 equal arcs of 30 degrees each, which expresses all the ways in which the square and the equilateral triangle can be related to each other in the circle, and also forms what we recognize as the template of a horoscope. is not just a translation of meaning, but is a generation of meaning. It is the relationships between the words we must use, not their definitions, that give them their meaning. As I understand it, this is why meaning has to be represented pictorially, diagrammatically: for only thus can relationships between things be represented. A diagram is a set of relationships made visible. Its meanings are encoded as angles. Young, finding words to be too imprecise and too circular (every entry in the dictionary is defined in terms of the other entries) for his Rosetta Stone, makes use instead of the “measurement formulae” of physics: our ways of measuring our sensations of the world using the elementary physical ideas of length, mass, and time. 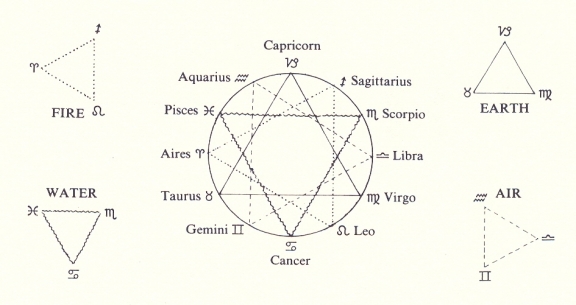 Young demonstrates how there are exactly 12 of these, and how and why, in their relationships with each other, they correspond to the 12 divisions of the circle of his Rosetta Stone. Young’s argument is deep and I don’t claim to understand it fully. But what he is saying is that astrological symbolism, if you look at it deeply enough, is a way of cognizing reality that is exactly analogous to our “scientific” (physical) way of cognizing it. The physical, scientific way of looking at the world measures it in terms of length, mass, and time, while the astrological way of looking at the world is qualitative: it sees the world as a place of qualities rather than quantities. It sees it as a place not of measurements but of interconnected meanings. Young goes on to discuss astrology at more length in his book, “deriving” the meanings of the signs from his diagram, the “Rosetta Stone of meaning.” Each sign has its appointed place in a complete, geometrically ordered symbol of reality. If you’ve come along this whole journey with me, this investigation of how astrology works, you’ll recall my posts about storytelling, and what Dante called the “polysemous” nature of spiritual writings. Now polysemous means “having multiple meanings,” and Dante was pointing to the rich meaningfulness of literary works. My own thought is that this meaningfulness of literary works is based upon, and ultimately identical with, the meaningfulness of life itself. Arthur M. Young, in his book The Geometry of Meaning, approaches this same issue, the issue of meaning, from the perspective of geometry and metaphysics. His “Rosetta Stone of meaning,” the wheel of the horoscope, is a kind of symbolic map of what could be called the “allegorical level” of meaning in life. Thus there is no conflict between “science”—that is the physical science taught in schools and universities—and astrology. While physical scientists use the measurement of physical quantities to study the world at its literal level, astrologers, and others who concern themselves with things beyond the literal, use the relationships between certain literal, physical objects—the stars and planets—to study the world at its allegorical level. The people we conventionally call scientists are “literal scientists,” while astrologers are what could be called “allegorical scientists.” Both of those layers of meaning are baked into the cake of reality, and it’s a fundamental mistake for either of these schools of practitioners to regard the other’s province as invalid. I have given an overview of how and why I think astrology works. If you’re a hardboiled skeptic, I don’t think this abbreviated argument will necessarily have converted you (although I congratulate you on sitting still through it all! ), but I hope that it will have given you food for thought. For my own part, as a poet (using the term in its widest sense), whether astrology is valid or not I am free to make use of its symbols and imagery, including that of the Age of Pisces, in my created work. But if it is valid, as I say it is, then in some paradoxical or self-referential way, my poetic work will have something to say about the literal level of the world. My story will be something more like history. But that’s another deep subject, which I will investigate separately. This entry was posted in astrology, thoughts and tagged allegory, Arthur M. Young, astrology, Dante, geometry, how astrology works, levels of meaning, meaning, Science, The Age of Pisces, The Geometry of Meaning by Arthur M Young. Bookmark the permalink. oh, you do have a rosetta stone astrology thing, I do not know what Young says, to me it looks very speculative….There is a Rosetta stone in astrology but it is an aspect configuration which resembles the trapeze, a copy of the Egyptian Rosetta Stone. Never heard of Young being an authority in astrology symbolism, if you wish to go deep into this subject read Liz Green, Carl Jung and of course the old guys, Manilius, Lilly, Ptolemy and this way you have the real deal. Hi Polaris. I had not heard of the “Rosetta Stone” as an aspect. I do have some of those works in my library. Thanks for taking the time to comment!